archivist representing a diverse selection of contemporary artists and artists’ estates. She is in addition a scholar on the work of the Indian Space Painters. Works by Steve Wheeler and Robet Barrell in "Indian Space Painters" at David Findlay Jr Fine Art in February-March, 2014. Whitney Museum's exhibition "Signs and Symbols" (June 28-October 28, 2012) included a key Steve Wheeler painting. Paintings by Steve Wheeler and Robet Barrell appeared in an exhibition at David Findlay Jr Fine Art in December, 2012. 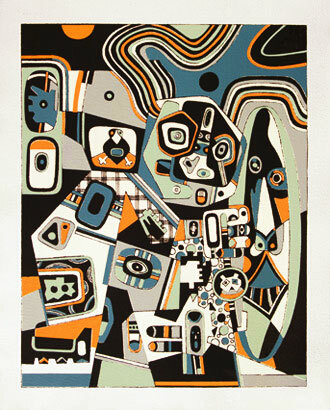 Serigraph, 1947. Sheet Size: 12 7/8 x 9 7/8 in.